Like all reptiles, choosing pet snakes depends on your experience, how the species of snake does in captivity and the amount of care required. There are many popular varieties of snakes available in pet stores, at Reptile Expos and from breeders. The large size of many adult snakes is also an important consideration. Snakes can live from 10 to 20 years or more, so do not get a pet snake unless you are ready for a long term commitment. See our list of recommended snakes here. In general, all pet snakes kept in captivity should be purchased from a reputable store or breeder. These snakes are already used to being in captivity and are more likely to thrive under your care. 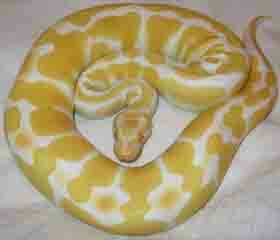 A reputable breeder will also start the snake on a diet that will ensure good health for the life of the animal. Snakes caught in the wild may not react well to captivity and may have other issues such as parasites. They may also not acclimate well to being handled. There are also obvious environmental concerns. A good online source for snake expos, purchasing and information on snakes is Kingsnake. The articles and classified section of Reptile Magazine is also a good source of snake information. Before buying ask about guarantees such as health. If you purchase online, check policy if snake arrives injured or dead. To avoid problems, try and order snakes during periods of moderate temperatures. Check belly or underside for any burn marks. Some snake cages are heated with hot rocks that may cause this injury. Most snakes rely on meat or insects for protein. Meat is easily provided in the form of live or frozen pinkie mice. These can be purchased from a pet store or online. Creating the perfect snake terrarium is part of the fun of raising snakes. 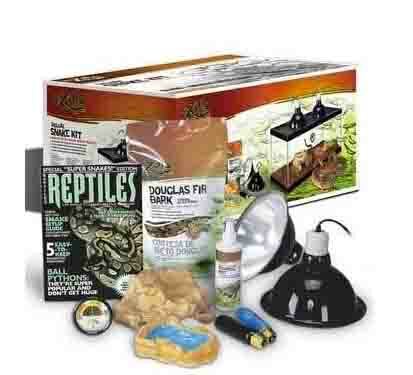 You can either create the perfect environment yourself, or start with one of the many popular commercial snake kits that includes everything you need to get started. One approach is to start with a snake kit, and then slowly customize the environment to meet the needs of your pet. See the descriptions below for information and information on each type of pet snake. Number of Snakes: If you are going to breed and care for multiple pet snakes, a larger enclosure will be required. Most snakes kept by beginners require a 20 gallon glass aquarium with a with mesh lid that tightly fits onto the cage. Native Environment: Snakes are found in many types of natural environments including woodlands, savannas (temperate), semi aquatic, tropical and semi-aquatic environments. Each of these has unique needs such as humidity levels, plants, substrates (the material that covers the bottom of the reptile terrarium and other items referred to as furniture. Furniture can include places for the snake to hide or bask in the heat. Heat and Light: Snakes are ectotherms, which means that they regulate their body temperature is regulated by outside temperatures. Because of this, snake cages need an area which is heated, an area that is slightly cooler and a night time temperature. In a reptile cage, heat is provided by either a pad attached to the outside of the enclosure or a ceramic heat light. The light needs to be far enough from the snake to avoid any risk of burning. The light is usually provided by a broad spectrum UVB light. Sunlight helps the reptile naturally produce vitamin D which is necessary for calcium absorption. If too little light is provided, dietary supplements are required. 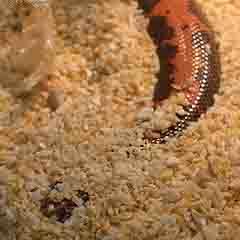 Substrate: A substrate is the material placed at the bottom of the snake cage. If a snake likes to burrow, then the material used needs to accommodate this behavior. If the snake does burrow, avoid heavy furniture or decor which could rest on top of the snake. Popular substrates include shredded newspaper and aspen. Note that some substrates such as sand could be ingested, causing a digestive system blockage. Water: A shallow dish for drinking and water areas help to reach the required humidity levels. 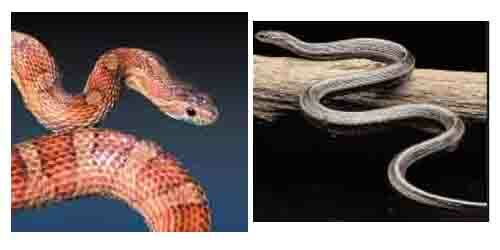 Snake Diet or Food: Reptiles vary based on their choice of diet. Most reptiles bred in captivity will eat a combination of foods. There are also commercial diets available for more popular species. Perfect pet snake choice for beginners. Comes in 30 colors and is widely available. Can grow to 30 to 54 inches. Diet consists of pinkie mice every two weeks. 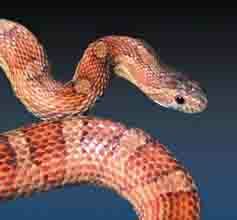 Corn snakes require a 20 gallon terrarium and can live for 10 or more years. 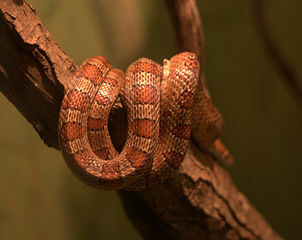 For more information download this corn snake care fact sheet (PDF) from Petco. The Rat Snake is one of the easiest to handle pet snakes. It is the most commonly found snake in North America. They have a gentle temperament and are easy to care for in captivity. This pet snake can grow to 4 to 8 feed and live for 15 years or longer in captivity. The snake diet is frozen pinkie mice or a commercial snake food. 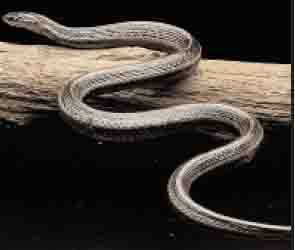 For more information on Rat Snakes, download this Rat Snake care sheet from Petco. The California Kingsnake is found in California, Oregon, Nevada and adjoining states. It can thrive in several different types of habitats including forests, woodlands and deserts. The snake can grow to 2 to 4 ft and can live as long as 30+ years in captivity. They are awake in the daytime (durnal) and if stressed with give off an odor. 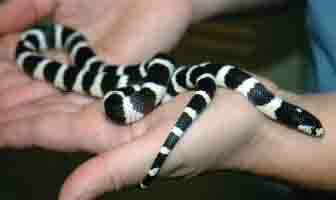 California Kingsnakes each mice in captivity. They are called KingSnakes because they will eat other snakes. Download this fact sheet for more information on the California KingSnake (PDF Download). The Variable Kingsnake (also known as Thayer's Kingsnake) has easy to follow care instructions and have a docile personality. In captivity, a Variable Kingsnake can live 15 to 25 years and will grow to 2 to 3 feet in length. Young juveniles and hatchings require a 10 to 15 gallon glass terrarium with a top that is screened. Adult Variable Kingsnakes require a 20 to 30 gallon snake terrarium. Download a Variable Kingsnake care sheet here (PDF Download). There are 4 types or species of Rosy Boas. These snakes can be tamed, are straight forward to maintain and are good for beginners. When bred in captivity they are docile. The diet consists of frozen pinkie mice and need to be fed 2x per week when young. Download a Petco care sheet for the Rosy Boa here. 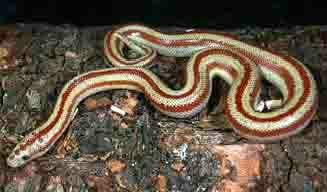 Subspecies include the Coastal Rosy Boa, Desert Rosy Boa, Central Baja Rosy Boa and the Mexican Rosy Boa. The lifespan is approximately 15 years and these reptile pets can grow to 20" to 42". The snake terrarium should be a 20 gallon long glass tank. The East African Sand Boa (Kenyan Sand Boa) can grow to 30 inches (females are longer than males) with a lifespan of 15 years. Two or three snakes can be kept in a 20 gallon reptile terrarium. The best substrate for this breed is shredded newspaper or paper towels, simplifying care. Diet consists of frozen pinkie mice. To learn more download this PDF on Sand Boa Care. The Ball python is one of the most popular pet snakes. The snake is available in a variety of colors and can grow to between 3.5 and 6 feet in length. The snake will live in captivity for 25 - 25 years. Only buy snakes born in captivity since snakes caught in the wild can be difficult to feed in captivity. The pet reptile terrarium will need to b 40 to 50 gallons in size. As the name implies, they are known for the way they curl into a ball. Ball Pythons are popular pets. They require a hide box, and a substrate such as cypress bark or aspen shavings. The Garter snake has 12 subspecies. The snake can live from 10 to 15 years in captivity and will grow to 18" to 36" in length. The terrarium should be 15 gallons, but since these snakes don't climb, the height can be as low as 12 to 14 inches. Snakes may bite until they are used to handling. Diet varies based on the sub-species, but generally consists of pinkie mice, worms, minnows, slugs and tadpoles. The snake digests quickly, resulting in the frequent need to clean feces from the cage. For more information on Garter Snakes download this care sheet from Petco (PDF). 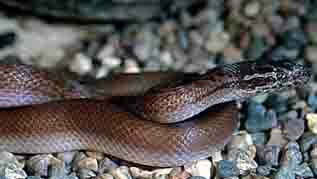 The Brown House Snake (African House Snake) is an easy to keep snake that can grow from 2 ft to 6 ft. in length. The snakes can live from 12 to 15 years. They require a reptile terrarium that is 10 to 15 gallons. The selected reptile cage substrate should allow the snake to burrow, with good choices being newspaper, aspen shavings or pine shavings. For more information download this Brown House Snake Care sheet from Petco. Have a Snake Related Question for our Vet? We Will Answer it for Free! Do you need some snake care advice? Just ask a question and our Vet will answer it as soon as possible.